Step 1 – Top up $50 worth of GrabPay Credits between June 10-11 to unlock the 50% off rides promo code. Step 2 – Use the promo code and pay with your GrabPay credits to get 50%* OFF Grab rides from 12-18 June. When you’ve successfully unlocked the promo, you’ll receive an email from us at 12 June, 6AM with further instructions on how to redeem your promo. It’s that easy. *capped at 4 redemptions a day per person. And yes, the $50 you top up will be credits that you can use on top of the 50% promo code. Please see below for an example. Open the Grab app> Click on the Menu bar > GrabPay > Top-up GrabPay Credits. Top-up through any of the following credit cards: China Union Pay, MasterCard and Visa. Can I use it on all Grab services? Yes, all Grab services except for GrabShuttle and GrabHitch as long as it’s between 12-18 June and you’re using the promo code sent to you. Capped at 4 redemptions a day per person. Can be used on all Grab services and will work with promotions that require a GrabPay condition. Can I use the GrabPay Credits I topped up to pay for my rides? Yes, your credits can be used for all Grab services and will work with promotions that require a GrabPay condition. Will my GrabPay Credits expire? Your credits are valid for a year from the day you top up. But we’re sure you’ll use them up sooner than that. It is limited to the first 100K eligible top ups between 10 to 11 June 2017. The ‘50% off grab rides next week’ promotion will start from June 12, 6am and end on 18 June, 11:59PM. 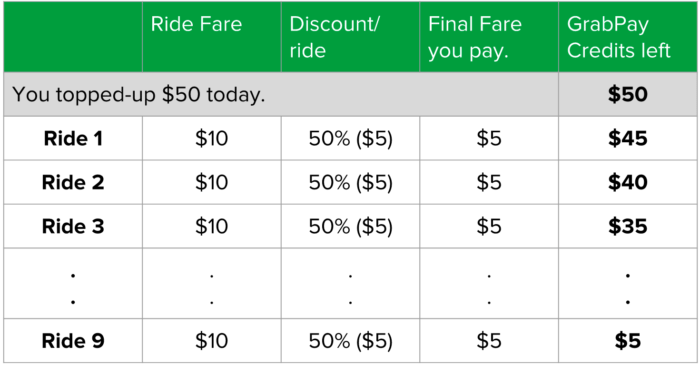 The 50% offer is capped at $10 for each ride. Each qualified passenger is limited to 4 redemptions daily. Passengers who break 1 long trip into multiple trips will be charged the no-discounted fare for the full journey. 1. How do I know if I’m eligible for this promotion? This offer is open to selected passengers only. If you are selected for this offer, you will receive a communication via email/ push notification. If you qualified for the promotion, you will receive a email with the redemption instruction, for the 50% off rides offer, at June 12, 2017, 6am. To claim the offer, please follow the steps listed in the email. 2. Do I need a promo code? You do not need a promo code to top-up the credits. If you qualified for the promotion, you will receive a email with the redemption instruction, for the 50% off rides offer, by June 12, 2017, 6am. To claim the offer, please follow the steps listed in the email. 3. How long does it take for my top-up amount to appear in my account? On average, your credits should appear within 2 mins. It is possible that some banks might have a longer processing time. If so, 1 hour would be the maximum time you would have to wait for your transaction to be processed. If you are still facing issues, please contact our support team. Visit our help page if you need more information on GrabPay Credits. “Top-up $50 GrabPay credits on 10-11 June and unlock 50%* off all rides next week! ” (“the Campaign”) is organised by Grab Pte Ltd. (“the Organiser”) and is open to all Grab users. The campaign will run from 10 to 11 June 2017 (Top-up of $50 GrabPay credits) and from 12 (6am) to 18 June 2017 (50% off all Grab Rides). Grab Pte Ltd reserves the sole and absolute right to alter or end the contest at any time, without giving prior notice or compensate in cash or in kind.